At this end of the year, although we are still a few weeks short of Advent, we are starting to get some very Advent like themes coming up in our scripture readings. This week it is very Advent like, with Joshua calling us to choose our path, Matthew telling us that we must live that choice faithfully because it’s no use trying to make up for lost time at the last minute, and Paul giving us some spectacular imagery of the return of Christ and the resurrection of those who have died with their trust in Christ. Now there is more than enough curly questions in all that to keep us going for weeks and weeks and we can’t cover them all here, so I’ll take a run at one of them and hopefully it will get us off to a good start. I want to look at the Matthew reading, because on the surface at least it seems to be contradicting some other things that Matthew says. Just before I get to the possible contradictions though, let me make a broader comment or two. This story is classic Matthew. Not only doesn’t it appear in any of the other three gospels, but it is hammering a theme that you could be forgiven for accusing Matthew of hammering to death. If Matthew has told us once he has told us a hundred times that just because you have associated yourself with the church of Jesus Christ, it doesn’t mean that you can rest on your laurels and not worry anymore about the faithfulness or integrity of your life. In this story there are ten bridesmaids. All ten have been chosen and all ten are together, dressed in their bridesmaid’s dresses and ready for the wedding. To the casual observer they are all “in”, but by the end of the story, half of them are “out”. If you can get through a study of Matthew’s gospel without picking up this message, Matthew will turn in his grave while waiting for the trumpet blast. Now, why do I say that Matthew is sounding a bit contradictory here? Well, back in the sermon on the Mount, in chapter 6:24-34, Matthew quoted Jesus telling us not to worry about tomorrow, about the food we need or the clothes we will wear, because God takes care of even the sparrows and the lilies of the field and so God will surely take care of us. But now, in this parable, he’s quoting Jesus telling us to make sure we are carefully prepared for tomorrow. Make sure you have enough oil in case there is a delay, you don’t want to be caught short. To have not prepared for tomorrow would be foolish, and the wise are those who have kept enough in reserve. So how are we to reconcile this? And if you think about it it gets worse. Normally the message we get from Jesus is a message that commends sharing – if someone asks for your coat, give him your shirt as well – but now Matthew seems to be telling us that the coming Christ, the bridegroom of the story, will reward those who refuse to share their oil and send their unprepared sisters out to fend for themselves. So what’s the story? What are we to make of this? Well, the first thing to remember is that, even though it might be tempting to construct an eco-message about the need to conserve oil(! ), we are not supposed to literalise the details of this story. It is a parable or an allegory (as a rough guide, a parable usually takes a simple real life situation like a farmer sowing seed to illustrate something, while an allegory constructs a story, often more complex and obviously fictional, where more of the details correspond to aspects of what is being taught). Once we realise that, then we can look again at our apparent contradiction and ask whether the two sides are actually talking about the same thing. Sometimes when we see a contradiction it is because we have over simplified the issues. Sure, sharing is generally a good thing to do, but don’t be too absolute about it because sharing herpes is not a good thing! Maybe when Jesus says “Don’t worry about the needs of tomorrow” and when he says “Make sure you’re stocked up” he’s talking about two completely different things. Maybe. So let’s look a bit more closely. Well, there’s not too much question what Jesus was talking about in Matthew 6. Jesus prefaced his comments about not worrying about having enough for tomorrow by saying, “You cannot serve both God and money.” He then goes on to talk about food, drink and clothing. There is no parable, no allegory. It is all straight talk. Don’t invest your time and energy in providing for your own needs. You’ve got better things to do and God can take care of you. There’s not much room for confusion here – Jesus is telling it straight and simple. 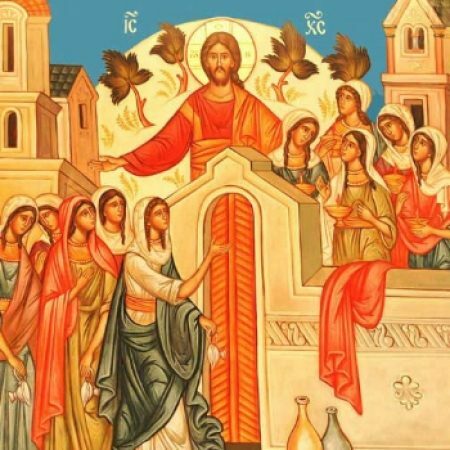 So what is Jesus talking about in the story of the wise and foolish bridesmaids? He’s certainly saying be prepared and don’t be caught short, but caught short of what? This time, as we’ve said, it is allegorical speech. He’s not actually talking about how many litres of candle oil bridesmaids need. There are some clear signs as to what he is talking about though. We’ve got two of Matthew’s favourite symbols in this story – weddings and lights. There are lots of wedding parables in Matthew’s gospel and they are all images of the great messianic banquet, of the marriage of earth and heaven, or of Christ and his church at the fulfilment of time. And light. “You are the light for the world. Don’t hide your light under a bushel. Let your light shine before people so that they will see the good things you do and praise your Father in heaven.” Oil doesn’t feature as frequently in Matthew, but in the Jewish tradition (and Matthew is the most Jewish of the gospels) oil is a frequent image for one’s works of righteousness and justice, or simply for one’s obedience to the Torah, the law of God. So we’ve got a good start just by looking at the most obvious symbols of the story. We have ten bridesmaids, representatives of the church, who at first appearances have nothing to distinguish them one from the other. All are called, appropriately dressed, and present, lamps in hand, ready to greet the bridegroom – the coming Christ – at whatever time of night he arrives. Their lamps, the light they shine to the world, are fuelled by their faithfulness and righteous action, but when the bridegroom is delayed what happens? For five of them the flow of faithfulness and righteous action dries up. By the time the bridegroom arrives their lights are not just under a bushel, they’re out of fuel. So it is starting to look as though this is not as contradictory as it first appeared. For followers of Jesus, preparedness for the unknowns of tomorrow is not about stashing away money and supplies to ensure your own needs are met. It’s about living generously, faithfully, courageously. It is about nurturing a life of justice and mercy and integrity. It is not even about sitting gazing at the sky expectantly waiting for Jesus to return. You’ll notice that when the bridegroom arrived in the story, all ten were asleep. It was not their sleepiness or wakefulness that distinguished them, but what they had available to fuel the lights that now needed to shine. So now the preparedness called for in this story is looking quite compatible with the carelessness called for in the sermon on the mount. They begin to look like one and the same thing. Because, in the language of the parable, if you spend your time focussed on providing for your own needs, stockpiling money and possessions, you will in fact be running your lamp dry. Action that is all self serving produces a dry selfish heart. Action that is taken in solidarity with others, that is generous and principled, is something that fuels your light, that builds your character. It is something that prepares you for the inbreaking culture of Christ. And what we’re talking about here is the stuff of the long haul. We’re talking about the bridegroom delayed. It’s easy enough to play the peacemaker for a day. When the hostilities drag on year after year, how many peacemakers have the fuel for the long night. Being merciful for an evening can give you a warm feeling inside. Being merciful in the face of persecution month after month takes the preparations of a transformed heart. Those who would be ready when the bridegroom comes are those who have built reserves of faithfulness and courageous love that can last a lifetime. What then of the puzzling and discomforting quirk in the story, the refusal of the five wise bridesmaids to share their oil? It seems to go counter to the thrust of the story. Well, yes it does a bit if you try to read the story too much as an example rather than as an allegory. But remember that its an allegory and read it again. You see there are some things you just can’t share. There are some things that cannot be given away – however generous one may wish to be. Or from the other side, there are some things you can’t acquire second hand. I can’t live off your faith. I can’t acquire the character that you’ve built and nurtured over many years of praying your life and living your prayer. I can’t borrow from your reserves of faithfulness and integrity. We each have to carve out our own integrity. We each have to live our own prayer. I can’t just choose a really cool and impressive church to associate myself with and expect to gain the credit for the courageous action for justice and peace that others in the church have undertaken. No one can go on living on the spiritual capital which others have amassed. Ultimately this story is an affirmation of the dignity and promise we are each born with. You will not stand judged for anyone else’s sin and you will not be credited with anyone else’s righteousness. You work out your own salvation. But wait a minute. Hasn’t this parable just denied the basis of our faith – that we are indeed saved by the grace of another, that our only hope is that Jesus credits his righteousness to us? What of the Christian gospel? Jesus does indeed give us oil for our lamps, but Jesus is not one of the other bridesmaids, is he? Jesus is the bridegroom. Jesus calls us and clothes us in robes of righteousness for the wedding and places lamps in our hand and oil in our flasks and says, “Be ready.” It is the oil given to us graciously by Jesus that we are called to keep replenished. It is the righteousness and justice given to us in grace that we are asked to live out until he comes. All of this is grace upon grace and the wise will not squander it.